So on my last night in “O” town, we decided to continue with the ethnic food quest. 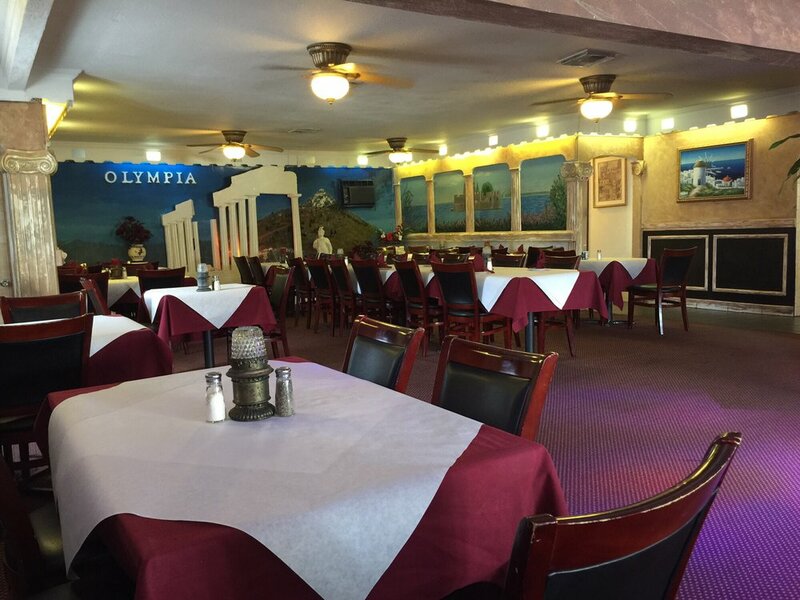 My food maven in residence chose Olympia, a Greek spot off Colonial Dr. I was in Greece last year and did not have one dish that was not outstanding, so I was stoked. We made it a point to look at the menu to get our taste buds ready. Then I saw it, Octopus; skinned and sautéed in lemon butter garlic sauce, served over pasta and vegetables on the side. I am now so giddy with pleasure it was palpable, 8 pm was a long way off. So when we arrived, the restaurant was busy but not crazy busy. 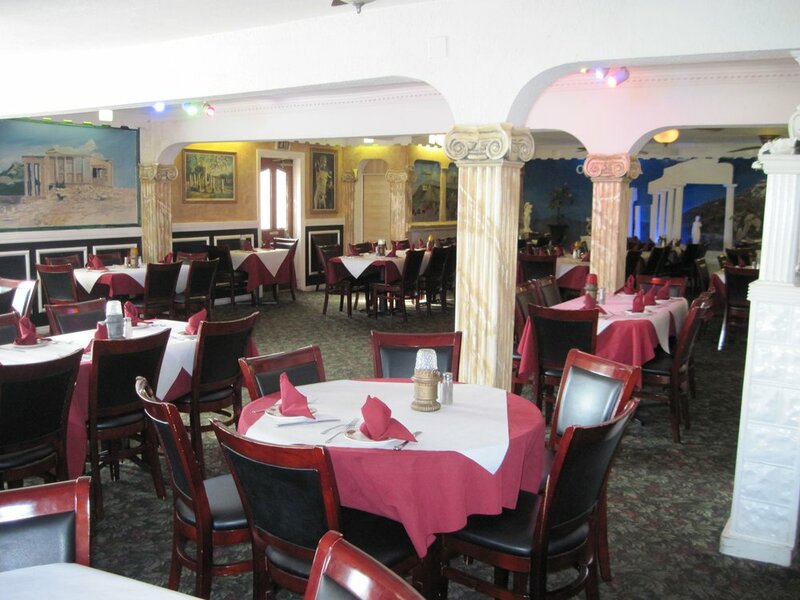 One large party of about 10, then several tables of two or three and 3 to 4 servers. We waited a few minutes before being acknowledged, but finally were seated. No menus were offered when we sat down, so we had to wait for our server to arrive, which took a little bit. Once she did arrive she apologized profusely for the delay, offered menus and to take our drink order. We settled in and looked over the menu, and low and behold the Octopus was scratched off the menu, it was time to leave! When the server returned with our beverages, I asked about the Octopus, and yep it’s gone. I suggested they may want to make corrections to the online menu. Again ” so sorry”, it became a night of sorry. 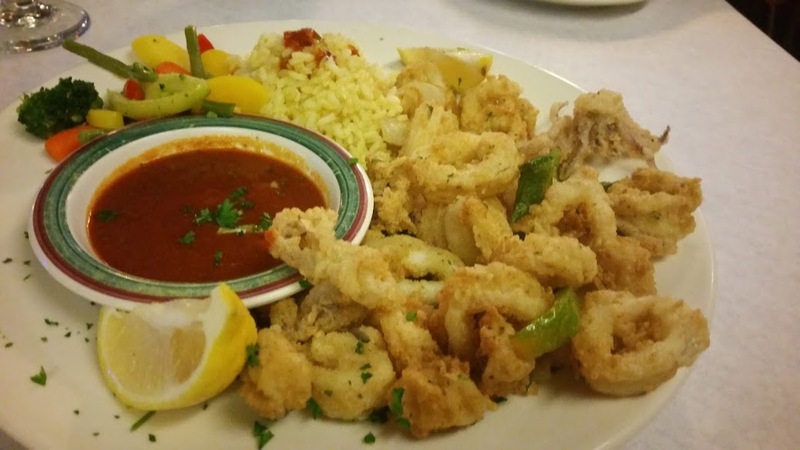 When she told me they did have Calamari and it was the same as Octopus, well what’s to say. 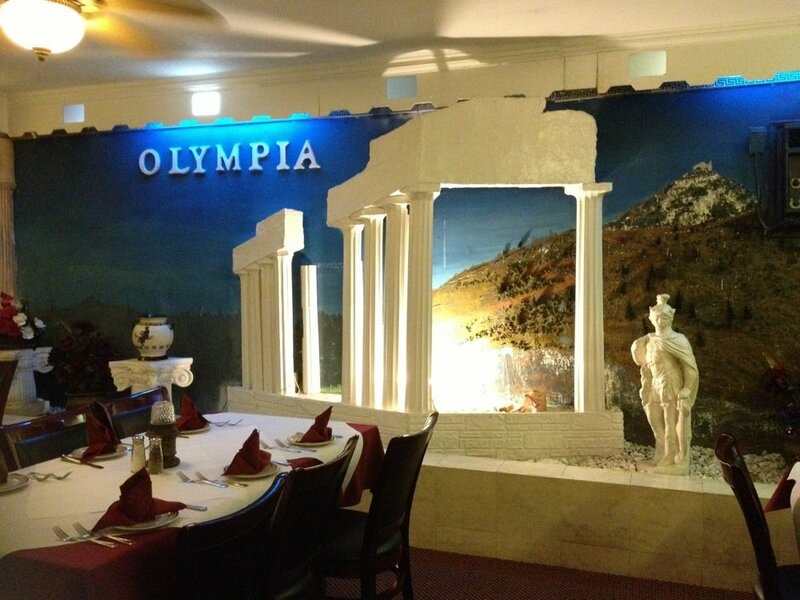 The menu was pretty basic, everything you have ever seen at any American Greek spot. Some of these items we really love so stayed with those. First up for our appitizers; Taramosalata, a Carp roe based spread, mixed with fresh squeezed lemon juice and extra virgin olive oil, and Moutabel, Eggplant based spread mixed with tahini, homemade yogurt and fresh minced garlic. Both served with pita bread. 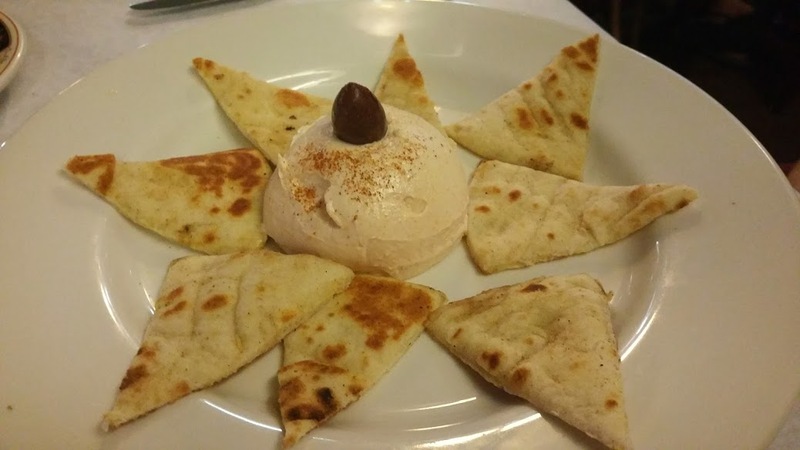 Both of these dishes satisfied, the tartness of the Taramosalata, was delightful and balanced by the sweetness of the Pita. It was evident a high quality grade of Olive Oil was a play here. 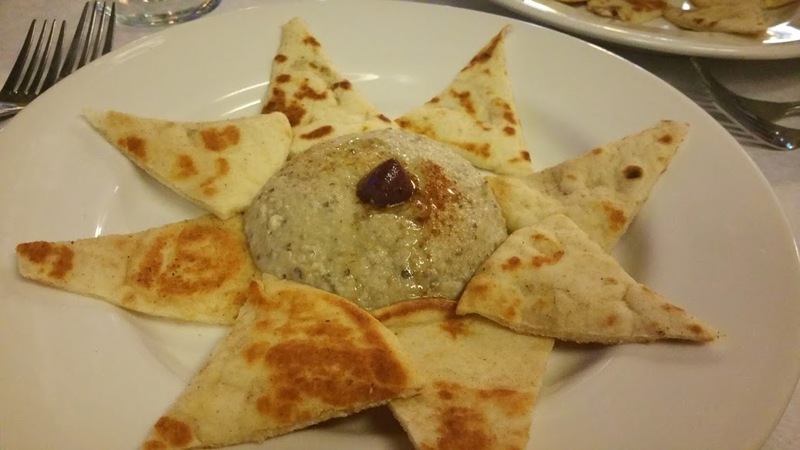 Eggplant dip was creamy with hints of garlic and taste of tahani. 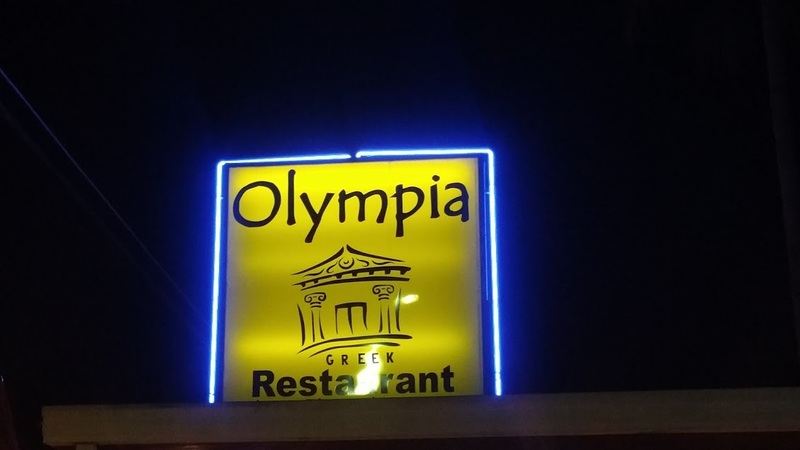 Once our server took our order, it was like she may have gone off to Greece to get the food, as we waited, one good diversion, the entertainment for the night began. As very attractive Belly Dancer took center stage and entertained us. She was quite good, and did an excellent job of engaging the audience, so much so my companion hit the dance floor. It was quite fun, but did not make up for the missing food or food server. We finally had to summons another server to see if they could locate our person. Once again she was with the sorry, and then blamed it on the kitchen. What? How do you drop the dime on the team? All the other tables, seemed to have food and the servers tending to their customers. Finally food arrives, my Calamari, arrived with rice, even though I requested pasta, vegetables so overcooked the fork went right through them and the unwanted rice salty. I can not believe this was fresh or hand breaded. Very disappointing overall. The Hercules Platter, fared much better. 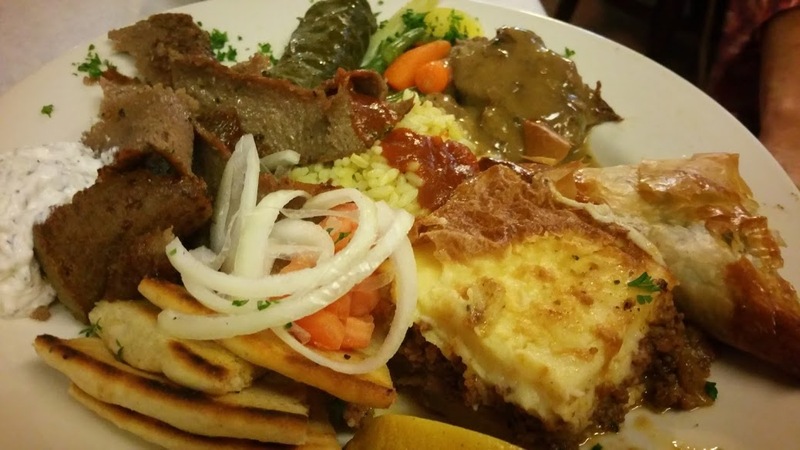 meat was tender and moist, spanakopita, mousaka well seasoned and flavorful. The vegetables on this dish equally as overcooked as mine. My host kindly shared her treasures with me. So one big win and one big lose. Our server never returned to see if we were happy, needed anything else, or just wanted to see her face. Once she realized we were finished she was there to offer the dessert tray. 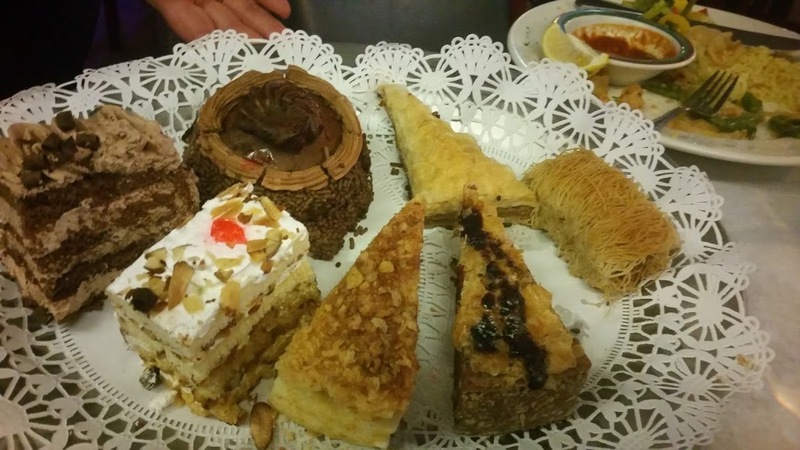 Although the desserts looked wonderful, and were a nice selection of all the best Mediterranean sweets you have ever seen we controlled ourselves and passed. It was two very strong women who could turn this down. So for those of you who read my blog I seldom practice the Rave and Rant portion of my title, but this will be the exception. I can’t recall in recent memory when we have had worse service at a restaurant. The fact this person dumped on her team mates to customers totally turned both of us off. 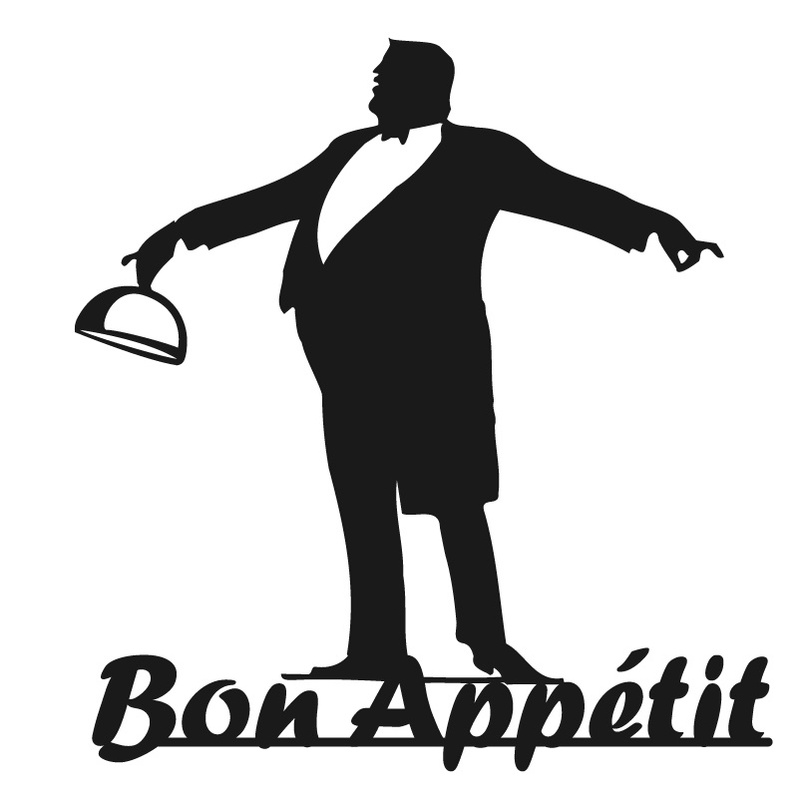 The food is not consistent, in quality, overcooked vegetables, rice not pasta, and salty rice at that. The high point of the evening was the entertainment. This is not a place we would visit again, but as always I encourage to make up your own mind.